The discovery of advanced stone tools in a cave in Malaga dating to about 44,000 years ago proves that anatomically modern humans reached Spain earlier than had been thought, an international team of archaeologists reported this week in Nature Ecology & Evolution. The tools, associated with the “modern human” Aurignacian culture, were dated using organic matter found with them in Bajondillo Cave – chiefly snailshells. The conventional wisdom had been that modern-type humans reached Europe around 40,000 years ago, from central Asia and the Middle East. But recent analyses have suggested that anatomically modern humans reached the Middle East and central Asia too – notably Turkey – at least thousands of years earlier. Now we have the evidence of advanced tools, snails and charcoal attesting to modern human occupation in a cave 44,000 years ago in Malaga. Solid paleontological evidence for early modern humans, namely identifiable bones, in Europe and central Asia is extremely rare. But a fragment of jaw found at a site called Kent’s Cavern in England dating to 41,000 to 44,000 years ago has been identified as anatomically modern human, with some archaic traits. Absent alien abduction, his or her ancestors would have reached Europe even earlier. A 2014 paper by Jean-Jacques Hublin of the Max Planck Institute for Evolutionary Anthropology, Leipzig on the human colonization of Europe, in Quaternary Science Reviews, suggests that the fist expansion into central Asia and eastern Europe began as early as 48,000 years ago. So, did anatomically modern humans pass through Spain as they spread out of Africa? Some may have, speculates co-author Professor Arturo Morales of the Autonomous University of Madrid. From a point on the North African shore, they could see the beckoning peak of Gibraltar. In recent years our theories of human evolution have changed profoundly. The time frames remain not only theoretical but controversial, not stone cold fact, but “we” began as the homo line split from chimps about 7 million years ago, give or take a few million years. About halfway along the journey to humanity, at least 3.3 million years ago, early hominins were competently making crude stone tools. About 700,000 years ago, our line split from Neanderthals, who populated Europe. Meanwhile Homo sapiens, us, began evolving about 500,000 years ago (not 200,000), it seems not in one specific spot in Africa but all over the continent, from south to north. A jaw was discovered in Jebel Irhoud, Morocco that was deemed to be modern human, dating to 300,000 years ago; another jaw in Misliya Cave, Israel, 200,000 years old; and a finger bone in Saudi Arabia, 85,000 years old. Evidently anatomically modern people were seeping out of Africa, if not necessarily migrating en masse, well before 60,000 years ago, though these earlier migrations may have gone extinct. We still can’t say when modern humans reached Europe, and when the Neanderthals living there before them died out. But the latest indications are that anatomically modern humans did reach Europe and Spain thousands of years earlier than had been thought. Because of the paucity of ancient human remains, especially in Europe and Asia, archaeologists have relied mainly on stone tool technology to tell whether a given site in Europe is Neanderthal or Homo sapiens. 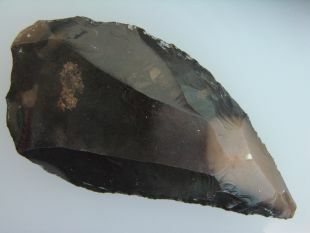 If tools found at any site are deemed to be Aurignacian in technique, characterized by striking fine blades off prepared cores, the site is deemed to have belonged to modern humans. The Neanderthals’ most advanced technique for knapping off flakes was called Mousterian. 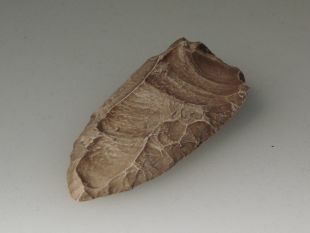 Mousterian stone tool culture spanned roughly 160,000 to 40,000 years ago; Aurignacian culture from about 47,000 to 26,000 years ago. So: If tools found at a European or west Asian site are deemed to be Mousterian, and no Aurignacian ones are found, the site is deemed to have been occupied by Neanderthals. If it has Aurignacian, it was peopled by modern humans. Indeed, the name “Mousterian” is based on the Neanderthal site of Le Moustier in France. Aurignacian tools are named after the Homo sapiens site of Aurignac, also in France. But early Homo sapiens were not born with silver spoon or prepared core in hand. Early anatomically modern people were also making cruder Mousterian-type tools, certainly in North Africa. Irhoud Jebel people were not making fine Aurignacian blades struck off prepared cores, Morales explains to Haaretz. 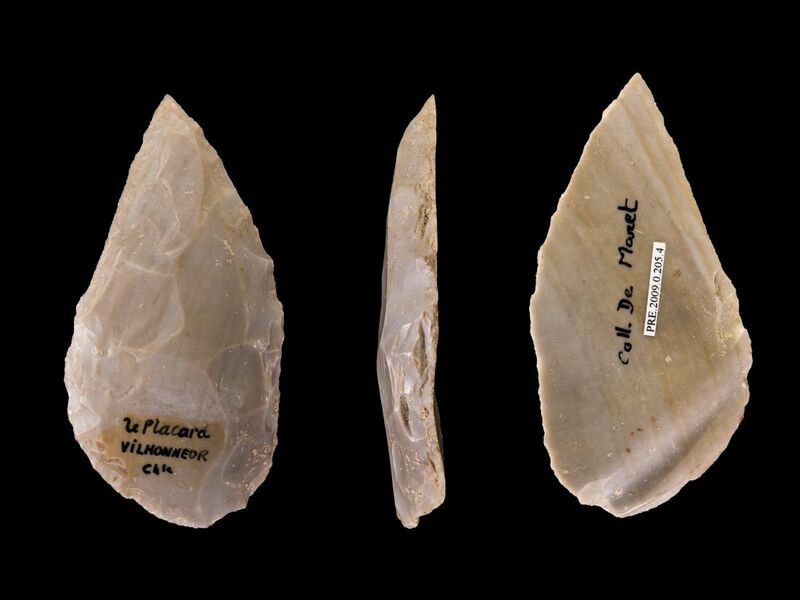 One cannot state that a site featuring Mousterian tools was necessarily Neanderthal, Morales says: In the absence of other signs, it could have been early human. During periods of low sea levels, Gibraltar and North Africa were connected, and certainly a million years ago, animals and hominins (with cruder Acheulean stone technology) crossed there. And later? Some disagree, Morales says, but he and others suspect early humans were crossing the straits of Gibraltar before the Aurignacian culture developed. “Anatomically modern humans have been found in northern Morocco as old as 300,000 years ago… and they were looking at Spain across the straits 300,000 years ago. If the straits could be crossed by things like toads and lizards and frogs, that do not stand too well – how could it be that for 300,000 years hominins or anatomically modern humans looking at Spain didn’t say, why well don’t we pay a visit to that other place across the river?” asks an amused Morales. No paleontological evidence of these very early ventures by early humans have been found, but it’s an intriguing thought, he says. Also, Morales says, crucially: The anatomically modern humans in Europe were associated with Aurignacian culture and industries, but “and it’s a big but - the modern humans in Morocco were associated with Mousterian. Nothing except for Mousterian has been found in Africa predating 36,000 years ago. Ergo, some Mousterian sites across the straits in Europe could have been early human, not Neanderthal. “We have serious doubts that all anatomically modern humans were using Aurignacian tools… it could be that we have anatomically modern humans much earlier but the tools are not Aurignacian,” he sums up. 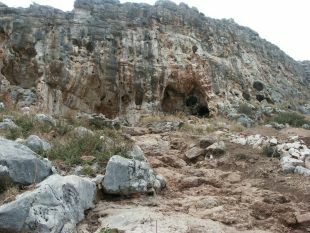 Professor Chris Stringer, the research leader at the Natural History Museum and co-author of the study, also feels that finding early Aurignacian tools in a cave so close to the sea adds to speculation that the Mediterranean coast could have been used by modern humans dispersing into Europe. “This dating also fits with growing evidence that Homo sapiens had already spread rapidly across much of Eurasia more than 40,000 years ago,” he said. The study of Bajondillo Cave in Málaga by researchers from Spain, Japan and the UK, coordinated from the Universidad de Sevilla, also suggests that the modern humans replaced Neanderthals there about 44,000 years ago: Mousterian tools were supplanted with Aurignacian type. 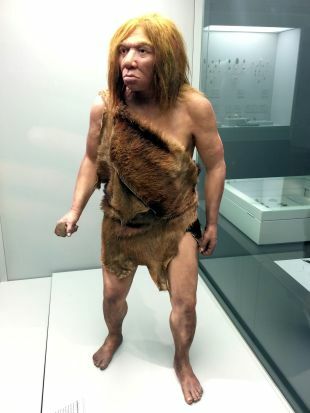 “Further research is necessary to determine whether the new Bajondillo dating indicates an earlier replacement of Neanderthals across the whole of southern Iberia, or in fact, an altogether more complex scenario of co-existence over several millennia,” the scientists write. It bears saying that Neanderthals would survive on Gibraltar until about 35,000 years ago, it is thought. That is where the first postulated example of Neanderthal art was found – the “hashtag,” a cross-hatching carved into the wall of Gorham Cave more than 39,000 years ago. Apropos Neanderthal art, it wouldn't be inappropriate to think again about the "painting" dated to more than 64,000 years ago found in La Pasiega Cave in Cantabria. It features a ladder form composed of red horizontal and vertical lines. The art was ascribed to Neanderthals, on the basis that there is no sign of early human presence there - no Aurignacian tools. But first of all, the hashtag and this remain the sole examples of "Neanderthal art" while examples of prehistoric human art from tens of thousands of years ago abounds in Europe. that was created more than 64,000 years ago, they say. Secondly, we now realize that not every Mousterian site in Europe is categorically Neanderthal. We can speculate, though no more at this stage, that possibly, anatomically modern humans crossing into Spain earlier than thought were responsible for the art. Co-author Jimenez-Espejo adds that at Bajondillo at least, modern human succession was not associated with a Heinrich (severe cooling) event. So much for the sapiens-serving theory published in late 2018 – that the Neanderthals froze while we clever monkeys overcame.